The July issue of Gramophone Magazine focuses on the 2012 Proms, including a calendar of events that includes not one but two programs featuring works by John Cage: August 14 & 17. The upcoming August issue (on newsstands Sept. 3, 2012) includes a nice piece by Philip Clark, inspired by his standing outside Cage's 18th St. apartment building in NYC and listening into the sounds that surrounded him. 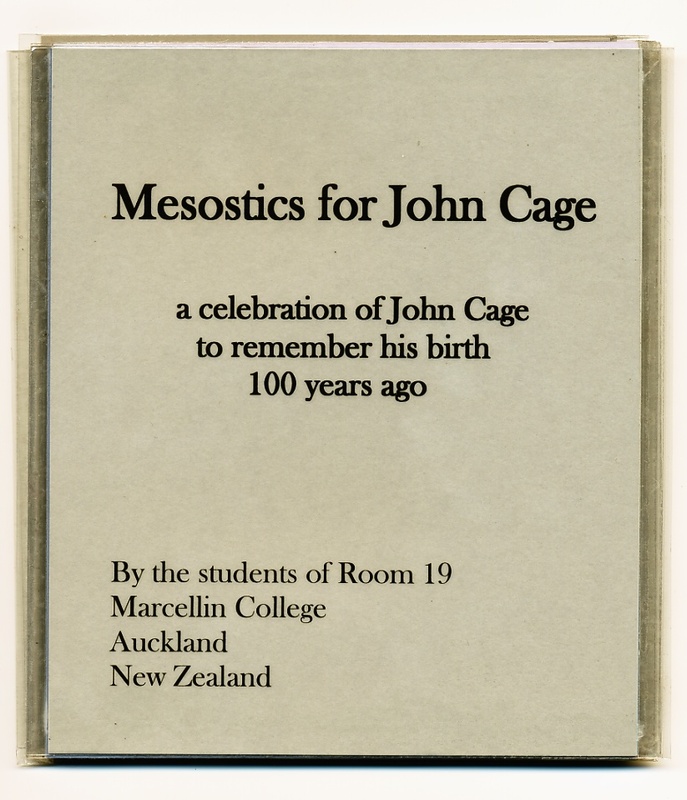 A web-only feature for this issue is James McCarthy's Top 10 John Cage recordings: "Ten Ways to Fall in Love with Cage." Congratulations to Don Gillespie for grabbing the #9 spot with his video realization of Cage's 49 Waltzes for the Five Boroughs (1977) (Mode Records, The Complete John Cage Edition, Volume 40, Mode 204, 2008). 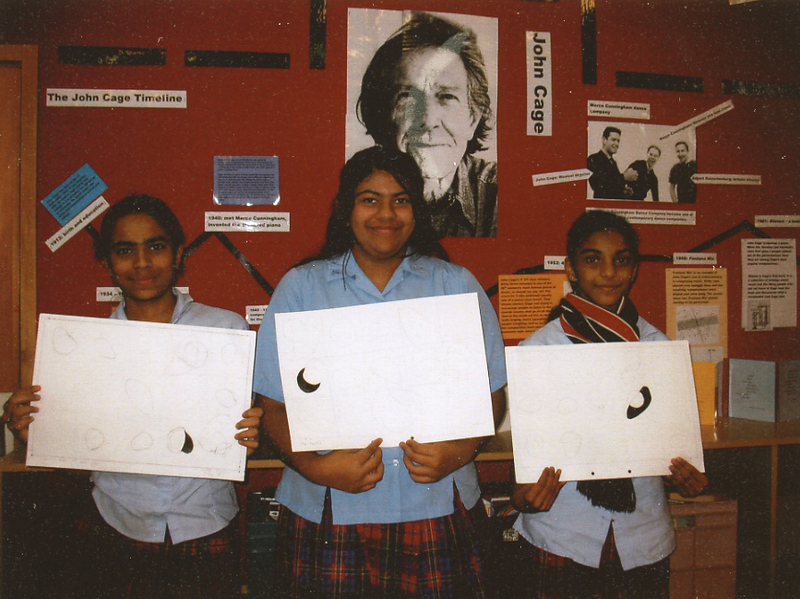 One of the great joys of working at the John Cage Trust is hearing from people from all around the world who are newly engaging with the work of John Cage. The latest? A spirited communication from Marcellin College in Auckland, New Zealand -- specifically the students of Room 19, a class of 29 8th-graders, under the happy tutelage of Barry Moffatt. In the photo just above, they're holding their original "rock drawings," which were created simulating Cage's techniques for his "Ryoanji" drawings with a grid and 15 rocks whose positions were determined by chance operations. Unlike Cage, however, they added their own little twist: a single highlighted rock, also selected by chance. othErs find them not too bad. 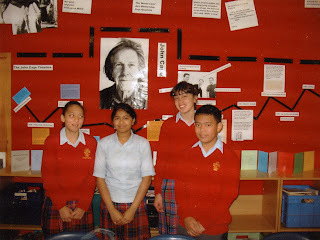 Barry Moffatt, their teacher, is an equally interesting fellow. Here he is outside Vesuvio's in San Francisco, a favorite travel destination. Dr. Moffatt holds a PhD in philosophy, with additional degrees in science and art history. When asked why, with so eminent qualifications, he chooses to teach young children, he points out that for a time Wittgenstein did as well. He tells me he is both a poet (his poems described by others as "abstract and obscure") and a visual artist (his work in this arena "better received than his poems"). 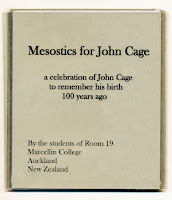 He is also an avid collector of Cage's works, both music and writings, and of secondary literature on Cage. Thank you one and all* for sharing your wonderful work. *Mary Aguilar, Trizhel Amon, Gadesvy Andrades, Leandra Augustin, Van Joseph Belinario, Seadon D'Silva, Nikko Eichler, Cesar Estoconing, Elijah Etuali, Kim Louis (Ivan) Evangelista, Steven (Jan) Gamo, Jenney Guo, Ivan Marsich Harris, Harlem Ironside, Gabriel Johnson, Joseph Kalavi, Liam Koloamatangi, Judit Mathew, Sinafoni Mikaele, Brandon Peters, Sharon Peterson, Alsana Rahaman, Isaac Rebello, Joelle Moriah Reid, Aidan-Paulenele Samasoni-Tukuitonga, Hasley Stephens, Benjamin Urquhart, Edgar Varona, and Trisha Villafania.